A&A Part III: Mold, or How Far Do We Go? We had the whole house checked, top to bottom, for issues and possible allergens after Martin started having these reactions. Overall, our house is doing pretty well. Mold in the air is low. Mold in dust samples (dust? what dust?) is normal-to-low. Mycotoxin sample shows barely perceptible positive for tricothecenes. Total VOC air sample is ideal, and mold VOC air sample is low. The consultant did notice “some mold on the floor joists in the basement,” which he speculates is leftover from before we bought the house. It does not appear to be affected air quality or spreading. So here’s the question: How far do we go? Before we moved into the house, a couple years ago, we had basement mold remediated. That mold had a clear source; the previous owner had left a ground-level basement window open during Superstorm Sandy—evidently she thought the basement would be better with “circulation”—and water poured through the window, leaving ickiness in its wake. Remediating that mess was like those scenes at the end of E.T. : The Extra-Terrestrial. You know, when scientists and government officials are obscured in protective gear, and plastic sheets cover everything. That was how our house looked, to annihilate the Sandy mold. You can imagine the cost. Do we do that again now, to go after some petty bit in floor joists not affecting air quality? Not at this moment, no. I’m going to put that mold onto the “monitor” list instead. Autism recovery, however you approach it, can be a highway to the poorhouse. Chasing after a bit of mold, right now, seems like a voluntary move into the fast lane on that highway. 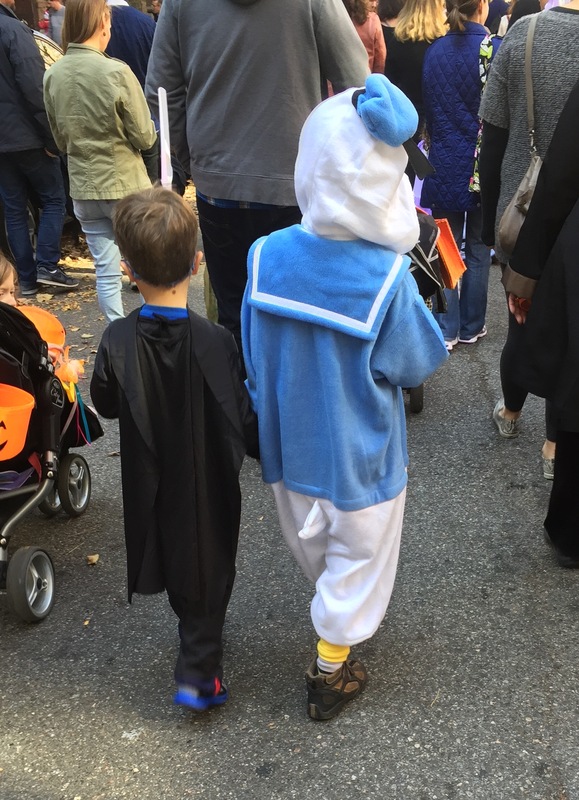 Martin, as Donald Duck, trick-or-treating with friend. When we moved to the suburbs, June 4, 2013, we bought Martin a new bedframe, a twin-size rally car frame. Because of wheels, bumper, and built-in shelf, it occupied more space than the plain, unfinished hardwood frame he’d had previously. In the City, his bedroom was too small for a fancy rally frame; the suburbs have some advantages. We did not, however, replace Martin’s mattress, which was an expensive organic mattress that I’d ordered two years earlier from California. A bedframe is one thing. An organic mattress does not get replaced so willy-nilly. Martin never adored the rally bed, even though he and Adrian had picked it out together on-line. I think the metal headboard and side rails were cumbersome. Martin still tends to toss and turn at night, and to throw his limbs over the bedside. I would hear him at night, banging his arms and head on metal. Plus, the metal was cold. I didn’t love the rally bed, either. At the time, I still had to pick Martin up, out of bed, while he was sleeping, to take him to the bathroom or help him wake up. As he grew bigger, it was hard to lift him over the rails without straining my back. What I did know was that the rally bed was safe. I’d researched the materials of which the frame was made, and the manufacturing processes, and I felt comfortable that they posed no particular dangers. This June, 2015, Martin decided to break up with his rally car bed. The end of their two-year relationship came suddenly. Martin, for a couple weeks, had been having trouble falling asleep. One night, after an hour or two of talking to his stuffed animals, giggling, dancing down the hall to the potty, and calling for drinks of water, Martin asked to sleep in the queen-size bed in the guest room. I can’t remember whether I acted out of frustration, or exasperation, or hope, or some combination; in any event, I let him climb into the guest bed, and he was asleep within minutes. The next night, the same scenario replayed. Martin stayed awake, busy as a bee, until finally he finagled permission to move to the queen-size bed in the guest room. The night after that, he skipped the rally bed altogether and asked to do bedtime in the guest room. He also stopped having trouble falling asleep. I don’t know why. Maybe the “trouble” was intentional, a ploy to try a different bed. The explanation he gave was, “Now that I’m almost seven, it’s just easier to sleep in a big bed.” That’s exactly what he said: “It’s just easier.” The little cad. After Martin had been sleeping, without issue, in the guest room for more than a week, Adrian and I devised a plan. I didn’t want Martin to continue sleeping in the guest room. Unlike his bedroom, the guest room isn’t coated in EMF-blocking paint, isn’t right next to my and Adrian’s room, and doesn’t have his name on the wall in wooden block letters. On the other hand, Martin wanted a bigger bed and seemed to be sleeping better in a bigger bed. His own bedroom, though bigger than his City bedroom, is not wide enough to accommodate a queen-size bed. Adrian and I decided the solution was to offer Martin a double bed for his upcoming seventh birthday, and to bill the gift as a “big-boy bed.” In fact, we would give his bedroom a mini-makeover, changing the Curious George theme to an outer-space theme, because he’s into planets and moons. A big-boy double bed needs a big-boy double-size mattress, and for Martin it has to be an organic mattress. To make our big-boy-bed plan work, I would have to bite the bullet and shell out a lot of money for a new organic mattress. I found an organic mattress showroom not too far from us, drove there one morning, asked questions, compared choices, and ordered a satisfactory option. I also purchased a waterproof organic mattress cover, for the various mishaps that can occur in a seven-year-old’s bed. Then I set about procuring two double-size organic cotton sheet sets. By the time all that was totaled, I was not in the mood to spend more money, and I suppose I let down my guard. I ordered an inexpensive bedframe, with storage drawers underneath, from wayfair.com. It arrived quickly, and with Samara’s help, I spent three days assembling the thing. (Adrian has myriad talents. The use of tools and hardware is not one of them.) The new organic mattress came just in time for Martin’s birthday. I filled the bed’s drawers with Martin’s stuffed animals, covered the mattress in organic sheets, switched the Curious George wall decals for outer-space wall decals, and hung up posters of the planets and moons. Martin loved his birthday gift. He immediately moved from the guest room back into his own outer-space room, into his new big-boy bed. That was at the end of June. Martin’s allergy troubles began in earnest over the summer. As part of our search for answers, I asked our environmental consultant to check for mold, mildew, or other triggers to which Martin might be responding. Almost immediately, he found elevated levels of formaldehyde in Martin’s bedroom. Formaldehyde! It seemed to emanate from—did you guess this?—the cheap bedframe I’d bought online after spending so much on the organic mattress and linens. Martin has been exposed to formaldehyde. Way to go, me. Worse still, the consultant theorizes that the expensive mattress may have absorbed enough formaldehyde from the frame to pose an ongoing problem. As soon as my parents, who are visiting from Texas, depart, Martin is moving back into the guest room and I’m throwing away—yes, throwing away, because although my first choice is to donate, I refuse to pass an unsafe product to any child—the bedframe. The double-size organic mattress will move to the basement in the hopes that it can air our enough to be safe again. (We have a well-ventilated basement with windows.) This time I will do my research and spend the money on a truly safe wooden bedframe, then have the organic mattress retested and hope it has become salvageable. Remember the organic twin-size mattress that we brought with us from the City, the one that was on the rally bed? I didn’t have the heart to let that mattress go. It was too expensive. In my office I have a daybed with a trundle. I moved the twin-size organic mattress onto the trundle frame, under the main bed, thinking that we might one day put it to another use. Then my cats discovered that they could crawl underneath the daybed cover, onto the trundle mattress, and be tucked into their own flat cave between the trundle and the main bedframe. Before I even pinpointed to where the cats were disappearing hours at a time, they had left so much fur on the twin-size organic mattress that I wonder whether it will ever be suitable for humans again. 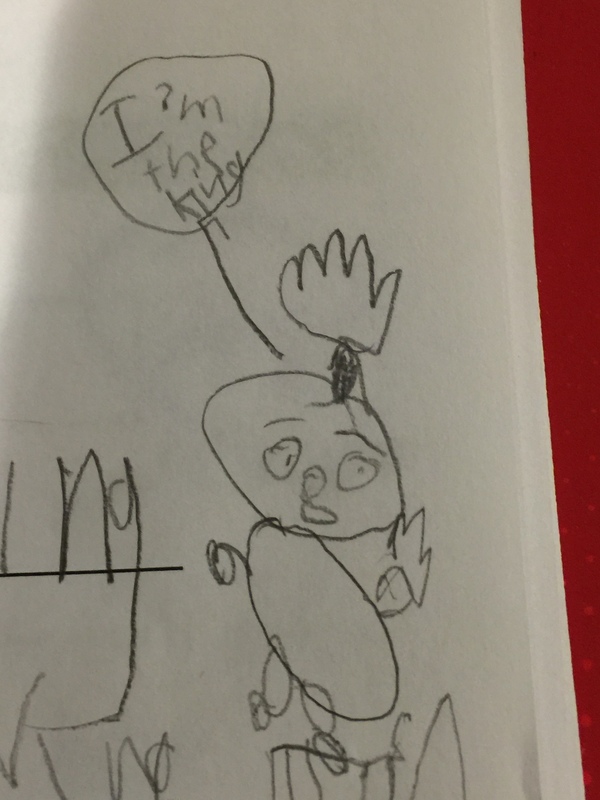 Martin doodled this on a homework sheet. I can’t be sure, but I’m hoping it’s some sort of representation of Henrik Lundqvist. A couple months ago I wrote about mysterious allergic reactions Martin was having: puffy watery eyes, runny nose, and (later) spots on his face. We suspected maybe a food was the culprit and also started searching for environmental culprits. We also started treating for chronic Lyme disease. The spots have not recurred. We have, however, had more sneezing and watery eyes. Then, last month, yet another symptom arose. My mother-and-law and I took a day trip with Martin to “Fun4All,” an indoor playscape way out on Long Island. We sat in the snack-bar area while he climbed, bounced, and looked for a friend. Every so often Martin appeared at our table, drank some water, and scampered off. I noticed he was sweatier than usual, and breathing heavily. I was happy that he was exercising so much. 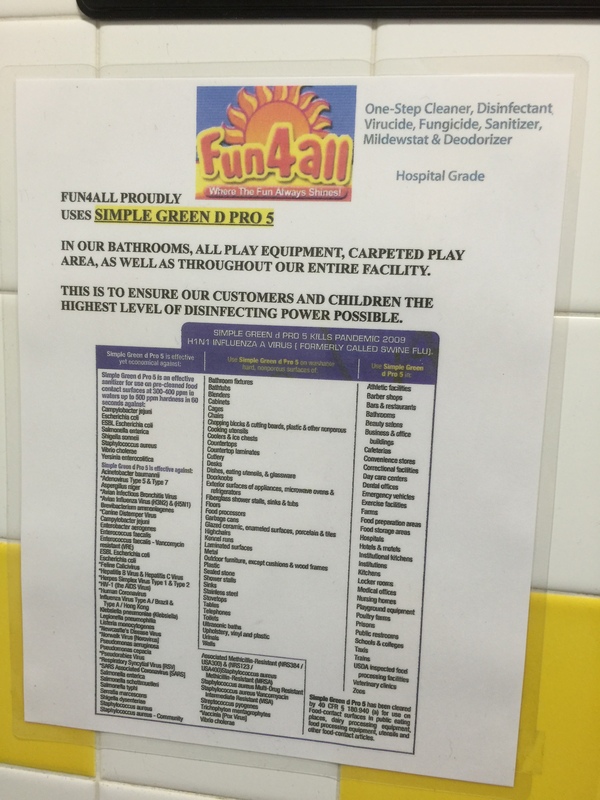 We exited Fun4All. In the parking lot, I realized that Martin was wheezing. He was having a full asthma attack, like the attacks that strike my older brothers, who are asthmatic. I used my iPhone’s voice-memo feature to record Martin’s labored breathing, so I could share it with his pediatrician. Then I loaded him into the car and gave him a bottle of water. The wheezing faded within twenty minutes. That was the first asthma incident. In the four weeks since, Martin has experienced half a dozen more, each time after exercising: ice skating lessons, bicycle riding, playground. He’s also coughed, a lot, had a generally runny nose, and breathed heavily at night. The search for answers entered high gear. I contacted our environmental consultant to retest our house for mold and mildew, which we also had done before we bought the house. I talked to Martin’s autism specialist (his biomed doctor), who advised me to bring Martin to his pediatrician for traditional allergy testing. The pediatrician also sent us to a traditional allergy/asthma specialist, to evaluate the results of the pediatrician’s tests and to conduct additional tests. I requested a phone consultation with Martin’s homeopath. Soon we were armed with an albuterol inhaler as well as a nebulizer for bronchodilators. (I don’t like to use pharmaceuticals with Martin, or with myself for that matter, but when it comes to breathing, I am not willing to mess around.) We also found, I hope, some answers. This is the first of four posts on A&A, allergies and asthma. The next three will cover the potential triggers we’ve discovered. I hope that, in a few months, I will be able to write a post about resolving the Martin’s A&A. I’m not happy about any of this. We’ve been fighting autism for years now. I don’t need any more A’s on my plate.